SMS stands for ‘Short Message Service’. SMS is a very effective form of messaging as it works on many older model mobile phones as well as on new smartphones. Final delivery of text messages sent via SMS involves a number of different parties, a huge number of different mobile devices of varying age and technical capability and many other variables. These variables create their own series of nuances that the sender needs to be aware of when including commercial SMS as part of their corporate / marketing communication. This document is specifically designed to help Taguchi® users understand some of the intricacies around sending an SMS from Taguchi®. Email and SMS activities set up within Taguchi® can be combined to create highly targeted and effective multichannel communication. It is important to read through this document carefully. An excess of 160 characters will split the message into two or more messages rather than just one. This can affect your billing. Please read through this guide to help understand how character counting works. 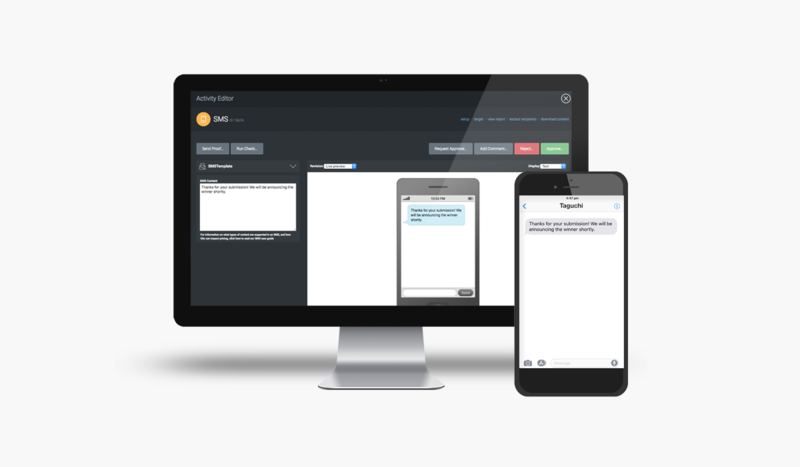 Taguchi partners with MessageMedia and has developed an integrated solution to allow Taguchi clients to create and deliver their SMS communications within the Taguchi Digital Marketing Platform. MessageMedia are Australia’s largest carrier of A2P SMS messages and offers two types of SMS service which carry two different deliverability performance and price points detailed below. This is the cheaper of the two SMS options and uses a combination of local and international gateways via that are integrated with the Taguchi® system to deliver messages. Whilst performance to date has proven to be reliable and cost effective, it is cheaper and likely to have more variation than the premium alternative. This option is generally used for general bulk message delivery where some delivery time variation is acceptable. This is a highly reliable SMS solution and uses Taguchi® integration via a local Australian provider with direct connections to major phone carriers (see diagram 2.1). Performance via the Premium service is generally more reliable than most cheap offshore solutions. This service can be used for bulk message delivery and is recommended where timely message delivery (e.g. transactions confirmation) is a priority. MessageMedia have invested heavily to ensure their systems and connections are robust and we have not had any major performance issues with them in the past. More importantly they are not reliant on Aggregators or one connection to the major networks to deliver messages. If there are issues on binds within a network eg Telstra, then MessageMedia is comfortable both technically and commercially to have those messages destined for the Telstra network, routed offnet through the Vodafone network. As the diagram, outlines they have multiple binds in each network. The other important feature of their UG Next Gen Network is the ability to autoscale out and up. More info on this solution can be provided if required. Note: Whilst MessageMedia are our preferred provider, Taguchi can integrate with other SMS providers should the client wish to use an alternative. Integration costs are subject to requirements. Message delivery relies on telecommunication companies known as ‘gateways’ who connect to other telecommunication companies known as carriers (e.g. Telstra, Vodafone) who have the direct contractual relationship with the message recipient. The service quality, connectivity and performance of these gateways and carriers varies greatly. Some gateways send messages they receive from Taguchi® straight away while others may bank messages up and send them batches. Therefore, there can be variations in when recipients receive their message from Taguchi®, even if all messages were sent at a similar time. There are few operational standards amongst gateways. Many of the cheaper gateways are located overseas and this may result in some messages being received many hours after they are sent. Whilst we have made efforts to reduce this possibility through using better-performing and more reliable gateways, it may still happen from time to time. The recipient’s mobile phone could be registered with any one of a variety of phone companies (i.e. carriers), again with a large variation in service quality, consistency and network coverage. This may also affect when the recipient receives the message. It is important to keep in mind that there are a multitude of phone types with various capabilities and that may also influence how a message is displayed and even when it is received. Even if the gateway and the carrier send the message as soon as they receive it, the recipient may be out of mobile range for long periods of time causing message delivery to be delayed or in some cases, abandoned. 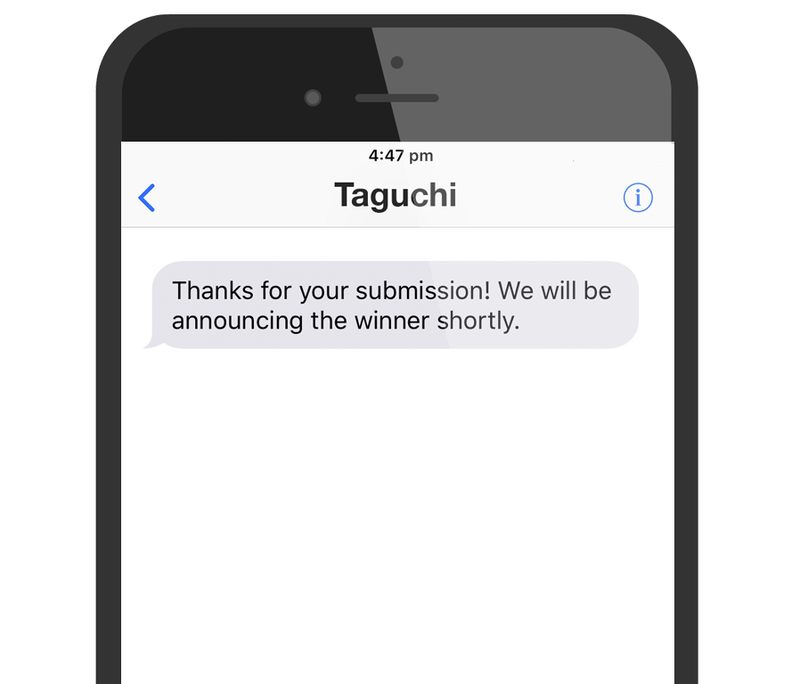 Taguchi® provides an easy-to-use SMS template and the process of distribution list selection, proofing and approval is like that for broadcasting Taguchi® emails. Text messages however do not allow the same degree of tracking analytics as broadcast email. There are some basic delivery reports available and these are charged for as an optional addition to the cost of sending the SMS. The maximum number of characters in an SMS is 160 and this includes all letters, spaces, and characters in any link URLs and unsubscribe messages. Taguchi® dashboard shows one message sent per phone number. The phone you tested the SMS on shows a single long message received. All recent phones display several messages they receive as a single message; however, these are still counted as several messages of a little less than 160 characters in length. Characters not found in the GSM 03.38-character set will result in the message being treated as UCS-2 encoded, reducing the number of characters per SMS to 70 or fewer. This includes the use of emoticons. What is an Alpha Tag? An Alpha Tag is a display name that allows you to feature your company name rather than a random number on a recipient’s handset. If you wish to update your SMS configuration with an Alpha Tag, please contact Taguchi Support. SMS communication is highly regulated and you must ensure that you comply with the Spam Act 2003 at all times. Fines for non-compliance can be very large so always ensure you meet all requirements. For full details of your company’s obligations under the Spam Act 2003 please use the link below and refer to your legal advisors with any questions. It is a contractual obligation of all Taguchi® users that they comply with the Spam Act 2003 or similar Australian Legislation. The recipient of the SMS you’re sending to must have given you their consent to send them a commercial SMS. That is, the recipient must have ‘opted in’ to receive any SMS from you. If a recipient complains about receiving an SMS from you, and you are subsequently questioned by an authority such as the ACMA (The Australian Communications and Media Authority), you must be able to show proof that you have the recipient’s consent to send them SMS messages. Every SMS you send must provide the recipient with the ability to unsubscribe or stop receiving future messages. A notification in a text message to reply ‘stop’ to opt-out or ‘unsub’ must be included as part of the 160-character limit. Include either of the following in an SMS sent from Taguchi® to inform the recipient about how to unsubscribe / opt-out of future SMS communications from you: “Reply ‘Stop’ to unsub” OR “Reply ‘Unsub’ to stop”. If the recipient replies to the message they receive from you and includes either of the above messages, they will be flagged in the Taguchi® database as unsubscribed. This means they will receive no more SMS messages from your Taguchi® account. Subscriber data (i.e. mobile numbers) — always be sure that the subscribers’ mobile phone numbers uploaded into Taguchi® are accurate. Simply be ignored by the SMS gateway for that subscriber after Taguchi® has transmitted it to them. Be accepted by the gateway as a valid format (even if it is incorrect), and the gateway will attempt delivery. Even though the delivery may ultimately fail, you will be charged for the attempted delivery to the gateway by Taguchi®. As the gateways do not report back delivery failures as a default service, this may result in this phone number being used over and over again in future, incurring unnecessary cost. Unless the number starts with a country code (e.g. 61), make sure there is always a 0 at the front of the mobile number. Some CSV files created from software such as Microsoft Excel ignore or remove zero from the front of any number when converted from an Excel file to a CSV file format. Word processors or rich text editors: Do not copy and paste text from Microsoft Word, rich text editors or similar programs directly into the Taguchi® SMS Template. This is because programs such as these can add formatting or control characters into the message copy that can cause issues or errors. Invalid characters that do not conform to SMS standards. Increased message length (and ultimate cost) from invalid characters or potentially undetectable white space. Poor message readability on certain phone handsets. We recommend pasting or creating text in a plain text editor to minimize any likelihood of invalid characters and assisting with character count accuracy. Examples of text editors include Notepad (on Windows) and TextEdit (on Mac). Content tracking links, Extended ASCII characters and personalisation variables can often extend SMS character length beyond 160 characters. Don’t rely on the Taguchi user interface to count the number of characters in your SMS. Perform an ‘activity check’ which will confirm the number of messages you will be sending for a single broadcast. Use the keys on your standard keyboard to add your content. Avoid pasting from rich text editors (e.g. MS Word). Include a reply ‘Stop’ or ‘Opt-out’ option. Make sure all the mobile numbers are in an accurate format. Only send a message to subscribers who have opted-in. Ensure anyone who has opted-out previously is removed from the broadcast. Send yourself a proof message to check your message on different hand sets if possible.